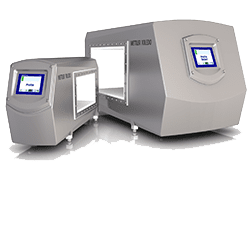 Mettler Toledo Safeline rectangular tunnel metal detector system is designed to offer unrivalled levels of detection sensitivity to all metal contaminants. When integrated with materials-handling and conveyor solutions, this complete range of industrial metal detectors provides fully automated product inspection for a wide range of food-processing applications. Our design team has extensive knowledge of the food-processing and packaging industries. The use of sophisticated computer modelling techniques and rigorous endurance test programmes has enabled the team to develop metal detectors that deliver a range of invaluable customer benefits. Tunnel metal detectors can be integrated with conveyor systems to provide inline metal detection solutions, capable of detecting and rejecting all types of metal, preventing contaminated products from reaching end consumers. Using a tunnel-type metal detector, it is possible to detect all kinds of metal contaminants, including ferrous, non-ferrous and even difficult to detect grades of stainless steel. When integrated with conveyor equipment, tunnel metal detector systems can provide advanced metal detection and rejection solutions for food and non-food processing applications. With a wide range of aperture size ranges and feature sets, Safeline tunnel metal detectors for conveyor systems offer an ideal solution to detect all types of metal for inline food and non-food processing applications. Delivers up to 50 percent improved sensitivity to detect smallest metal contaminants when inspecting products that are wet, hot, chilled, cooling or packed in metallised film. Provides the most advanced metal detection system on the market for dry product applications, with total inspection flexibility for a wide range of applications and products. When integrated with conveyor solutions, entry level Signature 300 metal detectors provide fully automated product inspection for a wide range of food and non-food applications. Provides the most advanced metal detection system on the market for dry product applications – fully optimised for inspecting large, conveyorised bulk products. Provides the most advanced metal detection system on the market for dry product applications – optimised for production lines with limited insertion space. Designed for easy integration into food production lines, the Signature Touch metal detector delivers high performance on-line metal detection. Our metal detectors utilise sophisticated software technology to provide the most advanced metal detection systems on the market, with total inspection flexibility for a wide range of applications and products. A large, full-colour touch-screen interface with an icon-driven menu provides easy, intuitive operator access. The interface simplifies procedures and provides your whole manufacturing team with valuable process information. A choice of system types (with the ability to configure feature sets to suit your processes) ensures that your metal detector is totally future-proof and can grow with your business needs. 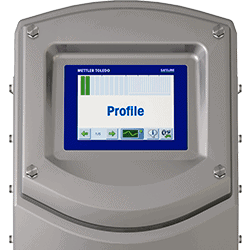 All Mettler Toledo Safeline detectors incorporate robust construction standards so as to provide reliable, consistent on-line performance regardless of the working environment.